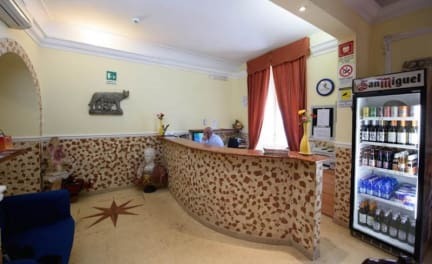 Hostel Termini is your best gateway to Italy's most magnificent city - with a perfect location in the heart of the city, with terrific rates and excellent accommodations, with superb access to all forms of transit, there's no better way to enjoy hypnotic Rome. 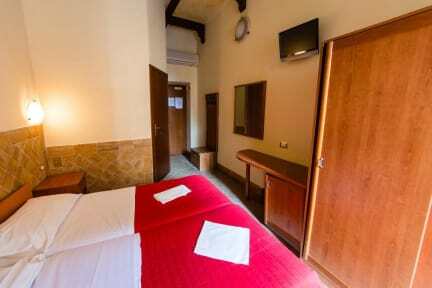 Hostel Termini offers secure, inexpensive, spacious rooms of 4-6 beds. - We have age limit: persons under the age of 18 are not permitted to stay in dormitory rooms. Are permitted to stay in private rooms single , double , triple etc. It's location is great but I just wish their equipments are functioning well. I had an air-conditioning at my room but it doesn't work. good quick stay nothing too fancy, nice breakfast. It was a nice hostel (hotel). Staff were very accommodating and nice. Breakfast wasn't anything special at all but was a nice spot in Rome to get to everything. The hostel in general is nothing special, but the rooms are clean and quite spacious. The doors were a bit loud, but otherwise the place is quiet. Breakfast wasn't amazing but better than nothing. It was nice to have an AC, but for four people in one room it wasn't strong enough. Book well in advance to get a discounted price. Great location close to the train station for leaving early or arriving late at night. The room was kind of basic but you spend most of your time exploring the city so it doesn't really matter. We had a good staying at Hotel Termini. However, its atmosphere are a bit rough. The location was simply fantastic, literally 4 minutes walking from Roma Termini. We had spent a long time at the reception waiting until someone take us up to the 5th floor, where our bedroom was located. The lift is a bit scaring due to its old structure. Besides the drawbacks, we have enjoyed our one night at Hostel Termini. We had a very short stay overnight to get an early flight in the morning and this accommodation served its purpose. It was cheap and close to the train station. We arrived late via taxi and could not find the mentioned sign post outside the building. We asked someone inside the building and they directed us further inside to a hotel of a completely different name. It was the right one, so don't bother looking for a "Hostel Termini" sign outside. No free wifi. My husband and I have stayed in a lot of hostels, and to be honest, this is the worst we have stayed in. The entrance to the hostel is very unclear. It's marked outside as Stargate, not termini. The room was quite dingy. The sides of the bed and the coverlet were stained. There was no air conditioning. The toilet seat fell off. The bedside lights didn't work. Also it was was extremely loud because the doors were so thin, so you could hear pretty much everything that went on in the hallway. The location is ok but this place is not a hostel it is a hotel. It was also not the easiest to find as the sign on the building is tiny and hard to see. The room was ok. You get what you pay for. The computers weren't working when we arrived so they couldn't find our booking but luckily the place wasn't to busy and they still managed to put us in a room anyway.